Havens, J. M., 1989: Collecting 18th century English drinking glasses [Part Three], Glass Collector’s Digest, Vol. 3, No. 2, pp. 70-77. 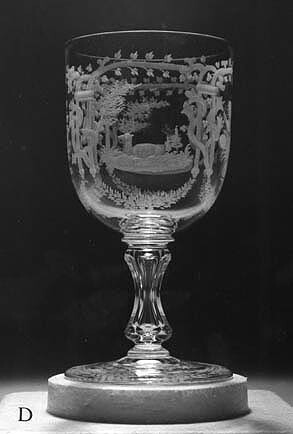 Hobstar Antiques [JMH], 1987: A nineteenth century presentation goblet, The Hobstar, Vol. 9, No. 8, pp. 8-9. The interest in copper-wheel engraved glass on the part of today’s collector is not great. Because of this, and because high-quality examples are infrequently found, this writer has purchased only a small amount of engraved glass for re-sale during the past twenty years. Fortunately, however, some pieces of particular interest were photographed at the time they were purchased. Four are discussed here, others elsewhere in these Web pages. The items chosen for this file span a period of more than two hundred years and involve engravers working in England, the United States, and Scotland. 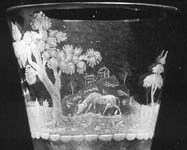 The wheel engraving of glassware had become established as a highly skilled craft in Germany by the end of the seventeenth century. During the eighteenth century it developed in Bohemia and Silesia and spread to Great Britain where it became popular and wide-spread, often with the assistance of German and Bohemian-Silesian immigrants. 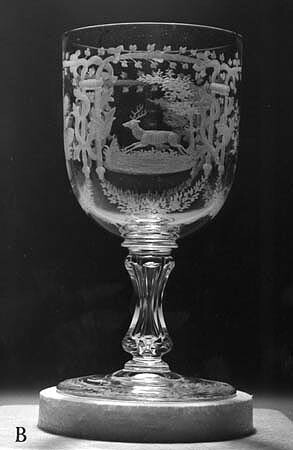 Engravings of high quality — such as this bucolic landscape — were probably made by these immigrants; more simply engraved glassware of this period is usually attributed to English engravers. Although the immigrants were foreign by birth and training, their work was eventually influenced by an English aesthetic. Formal floral borders gave way to more informal arrangements, and the landscape itself became more naturalistic, as is well represented by the present example. 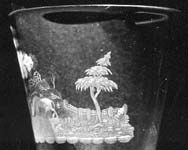 Copper-wheel engraved landscape on a wine glass dated c1790. A black cloth has been placed in the bowl of the glass. Height of engraving about 1.5″ (3.8 cm). It is possible that the cologne bottle below pre-dates the wine glass. On the other hand, it could have been made as late as the early nineteenth century. The symmetrical Baroque style of engraving includes Laub und Bandelwerk (“leaf and strapwork”) which developed during the late seventeenth century in Germany. By the middle of the eighteenth century it had become popular throughout central Europe and, to some extent, in England. The glass-metal appears to have a fairly high lead content and, therefore, cannot be of central European origin. The shape of the bottle is reminiscent of the eighteenth century bombé form found in cabinet work. The bottle’s stopper fits fairly well, but one that is round rather than flat would be more appropriate. It is hand-pressed and wheel-cut, and is typical of stoppers made during the late eighteenth century. 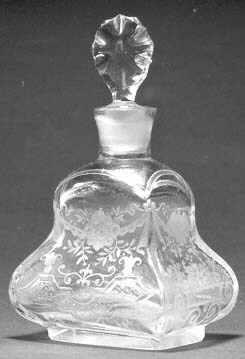 As mentioned above, the bottle could have been made much later than the mid-eighteenth century date that is suggested by both the bottle’s shape and its engraving. The former could be a nineteenth century “revival,” while engraving styles are known to persist for generations. This cologne bottle is something of a mystery. Copper-wheel engraved cologne bottle with bombé shape. Origin and date uncertain. Solid, flat base, ground and polished. Stopper is probably a replacement. H = 7.5″ (19.0 cm), W = 4.25″ (10.8 cm), D = 3.5″ (8.9 cm), wt = 2 lb (0.9 kg). Sold for $100 in 1996. The notebooks of several nineteenth century engravers are now known. 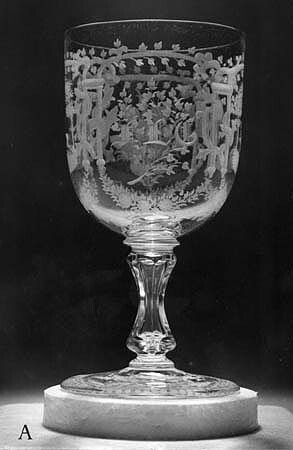 Perhaps a stylistic comparison will some day identify the highly competent engraver of this presentation goblet. Copper-wheel engraved presentation goblet. American, c1870. Colorless lead glass. Four scenes framed by woody vines and floral swags as follows: (A) Three initials with a leafy branch, (B) Leaping deer in a landscape, (C) Floral bouquet, and (D) Deer in repose. Engraved foot with ground and polished pontil. Waisted stem with an air trap and cut flutes. (White arc in base of bowl is a reflection.) H = 6.25″ (15.9 cm), rim D = 3.25″ (8.2 cm). Sold for $225 in 1987.